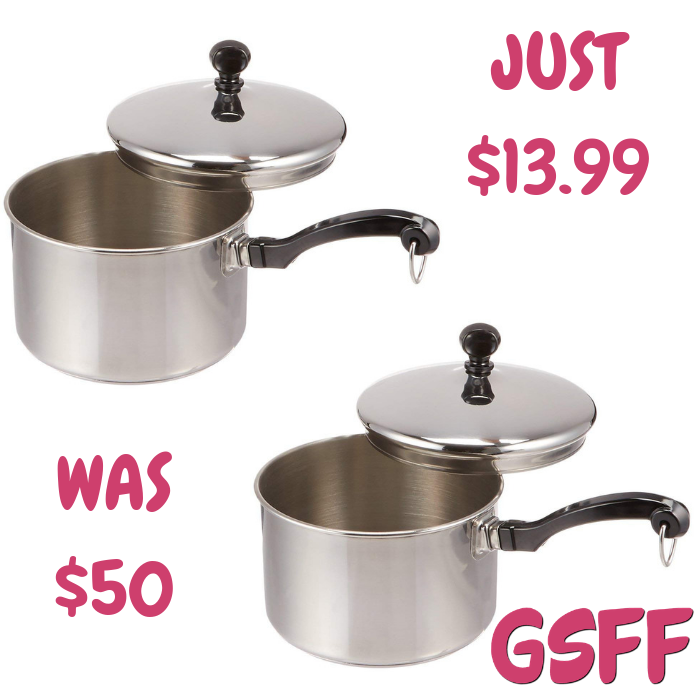 Farberware 2-Quart Saucepan Just $13.99! Down From $50! Shipped! You are here: Home / Great Deals / Amazon Deals / Farberware 2-Quart Saucepan Just $13.99! Down From $50! Shipped! Amazon is currently offering this Farberware 2-Quart Saucepan for just $13.99 down from $50 PLUS FREE shipping! Functional as well as beautiful, this 2-quart saucepan is made of heavy 18/10 stainless steel polished to a mirror finish. The pan has an aluminum core in its base to spread heat quickly and evenly. The core is completely clad in stainless steel so, like the rest of the pan, the bottom resists corrosion and discoloring and cleans up easily. Thick rolled rims add durability and make it possible to pour from the pan without dripping. Because the pan comes with a domed lid that self-bastes foods it can be used for reheating a portion or two of cassoulet or macaroni and cheese on the stovetop or in the oven without drying it out.